Mint or Lavender Lemonade: Make a simple syrup in a saucepan – ¾ cup sugar, ½ cup water, ¾ cup packed fresh mint leaves (for lavender lemonade substitute 1 ½ tablespoons dried lavender flowers for fresh mint). Bring to simmer, stirring occasionally, & cook until sugar is dissolved. Remove from heat & let steep for 10-15 minutes. Strain through a sieve, catching liquid in large measuring cup, pressing mint leaves to extract liquid. In large pitcher, combine sugar syrup with 1 2/3 cups fresh-squeezed lemon juice, 4 cups ice & 4 cups water (or more, to taste). 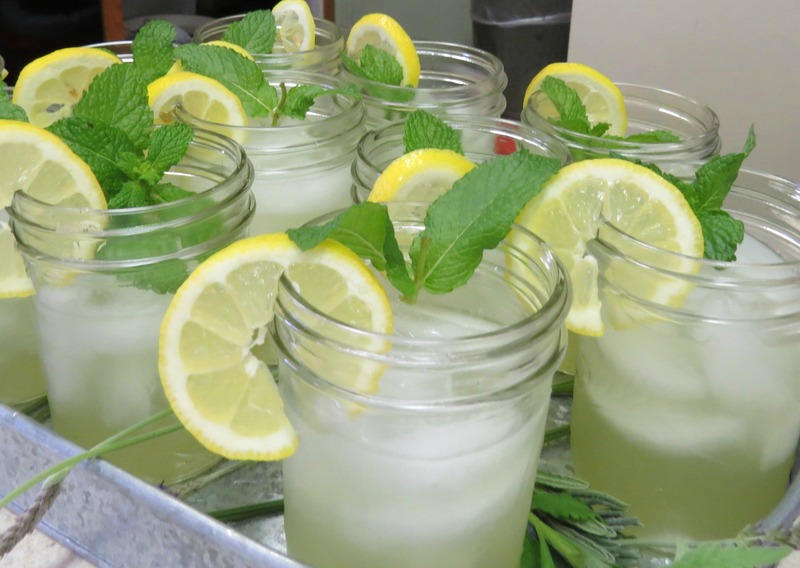 Pour into glasses or Mason jars (I had 1 pint size; we filled them half-full w/lemonade, then added ice cubes), garnish with lemon slices & sprig of mint. Makes 6-8 servings. Note: I doubled this recipe and served it to our volunteers after our field trip with West Dallas Community School on Tuesday. Refreshing-just like being with kids in the garden. To read more about National Lemonade Day, click here. Posted in Recipe and tagged Dallas Morning News, garden recipe, Herbs to Grow and Use in Dallas, West Dallas Community School. Bookmark the permalink. Mmmmm, love lemonade. Now I’m thirsty! The lavender version look good too!